After attending a meeting hosted by our building management, Tishman Speyer, JMC Steel Group has to participate in the Green Office Challenge. We’re excited to take part in the challenge in order to reduce energy, materials, and water consumption – and encourage other colleagues and peers to do the same. The Green Office Challenge is designed to help Chicago businesses and employees improve sustainability and demonstrate environmental leadership to help make Chicago an even better place to live and work. Going green feels like second nature for a company like ours – we’ve always benefited from the preexisting green construction. For example, our lighting fixtures have both daylight and occupancy sensors, which greatly reduce energy consumption. Many of our plumbing fixtures are “low flow,” and are below base line for water consumption. Almost 80 percent of the electrical equipment used in our office is ENERGY STAR rated. And thanks to Tishman Speyer, we have a comprehensive recycling program. 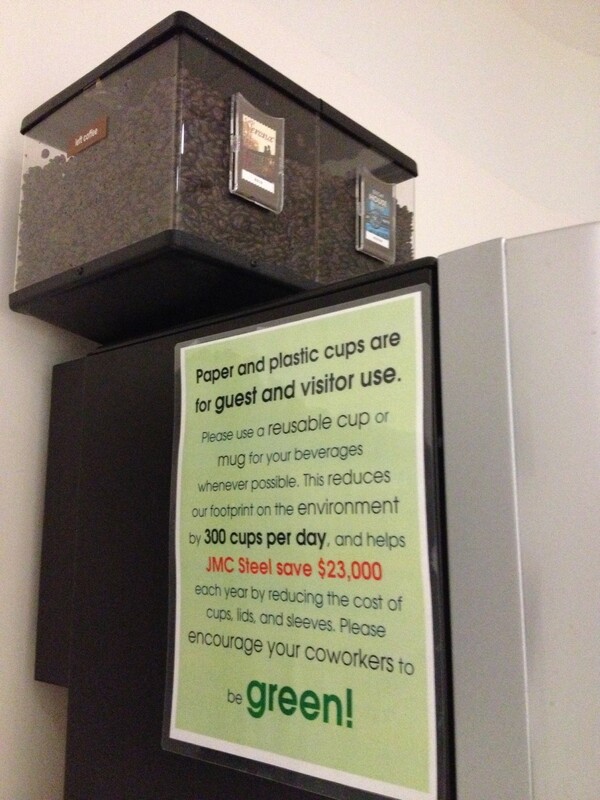 We recently started a new program in our office to reduce paper, plastic, and foam cups. We purchased reusable, recyclable plastic cups for everyone in the office and encouraged their daily use. We went from using 200-300 paper, plastic, and foam cups per day to about 25 per day. We are proud to be LEED Silver certified in this office and to be tenants of a building that encourages sustainability. Taking part in this Green Office Challenge is just another way to show our commitment to helping Chicago businesses and employees improve sustainability in the workplace and beyond.